Photo courtesy: W.A.T.C.H. 2018 Worst Toys report. Parents should never leave infants in their cribs with toys, especially those with small pieces or strings. This toy is marked for ages 0+, for use as a nightlight or bedroom toy. While it does carry some warning labels – warning parents not to leave it in the crib or let children play with it unattended – this isn’t enough to protect children. W.A.T.C.H. cited this and other hazards, including small accessories and a warning about batteries which can leak. 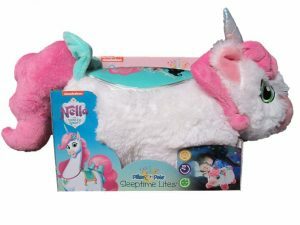 This toy is being sold online through Target.com and Google Express, as well as in Target stores. Nerf toys have received bad press for causing eye injuries. 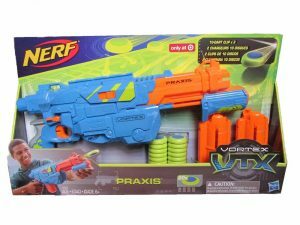 In this case, the Nerf gun is recommended for users age 8 and older and can shoot 10 discs in a row. W.A.T.C.H. calls this a potential hazard for eye and facial injuries. The blaster is sold at Target. Target.com, Amazon.com, Walmart.com, Ebay.com and Bonanza.com. These make the list because they can cause injuries and can encourage hitting. The claws are encouraged for children age 5 and older and the packaging states children can “slash” like the Black Panther.” At the same time, the packaging also advises children not to swing at other people or animals and to steer clear of breakable objects. If children use the toy, they are likely to break all those warnings, which is why W.A.T.C.H. included it this year. This is a sword-like toy and made the list for poor taste and the potential for facial and other impact injuries. You may think this is a sweet, fun gift. But the toy has a removable headband, which W.A.T.C.H. says can be ingested. 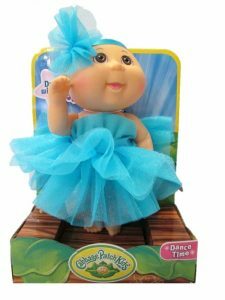 The toy is marketed for children age 2+ and is sold at Target, Target.com, CabbagePatchKids.com, Bonanza.com and Blinq.com. This Vtech brand toy made the list for presenting a potential choking hazard. A young child could put the drumstick handle in their mouth and block their airway, W.A.T.C.H. says. The product is designed for children age 1 1/2 to 4 years old. It is sold at Walmart, Walmart.com, as well as Amazon and other retailers. This pink ballerina and her kitten are not safe, W.A.T.C.H. says. There is nothing wrong with the little girl, but the kitten can become detached and a child could ingest it. A few of the retailers selling the toy: Amazon.com, Walmart and Barnes & Noble.com. This product is for children age 6 and older. Children are supposed to step onto the pedal to launch the rocket. The rockets can go high – up to 200 feet. W.A.T.C.H. recommended parents keep it off their holiday shopping lists this year, saying it can cause serious eye or face injuries. Magnetic fruit toys with a hard plastic knife are not a safe gift, W.A.T.C.H. says. The set is marketed for children age 2+, even though the knife can be used to cause puncture wounds. W.A.T.C.H. says this toy falls between regulations and safety. Manufacturers can only market toys with strings under 12 inches for use in cribs and playpens. Pull toys don’t have the same restriction and the result is a toy with a 19-inch draw string can legally be sold to children. The age recommendation on this product is only 1-3 years old. There are no safety warnings. It is available on Amazon.com, Magic Beans and Mbeans.com. More information on the 10 Worst Toys of 2018 list. Breakstone, White & Gluck is a Boston law firm specializing in personal injury and product liability claims. We represent those who have been injured by the negligence and wrongdoing of others. If you have been injured, it is important to learn your legal rights for seeking compensation to cover lost wages, medical care and other financial losses. For a free legal consultation, contact the Boston personal injury lawyers of Breakstone, White & Gluck at 800-379-1244 or 617-723-7676 or use our contact form.